This dreamcatcher has a complicated spider web pattern, which takes several days just to weave the web. Handcrafted in the USA especially for you. We make it when you order it, to your specifications, so allow at least a week for construction time, or even two weeks during peak shopping periods like the Christmas buying season. 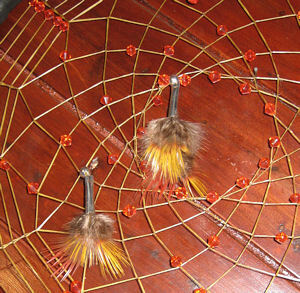 This genuine buckskin dreamcatcher is available in a variety of natural and dyed deerskin colors (shown in black). It has many, many crystal bicone beads in the web, as well as a large chunk of coral and/or other specialty stone focal beads. We will choose a focal stone to match the color of the crystal beads you choose. Whatever it is, it will be impressive! Several brightly colored pheasant feather also adorn the web. It has twelve long fringes decorated with your choice of feathers (shown with irredecent black coque feathers) held on with glass crow beads. 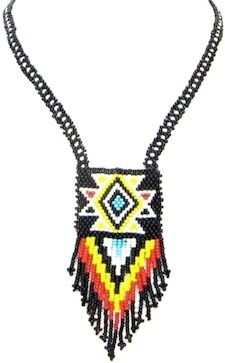 We will choose crow bead colors to complement your leather and feather choices, or if you have a preference on the color of the crow beads and the primary color crystal beads in the web, leave a comment in the comment box provided on your checkout form. We have all the colors of Crow Beads and crystal beads shown in our craft section. The end of each long fringe is tipped with your choice of silver or brass colored metal cones and each fringe bundle has a large specimen feather (shown with simulated eagle feathers). 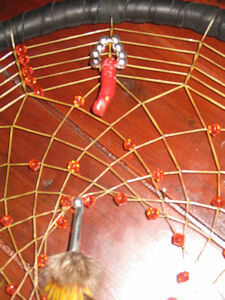 This dream catcher is 15" in diameter x approximately 36" long (not counting the hanger). Length will vary slightly, depending on your feather choices. The picture shown is representative. The one you receive may vary slightly, since each one is individually handcrafted just for you in the USA. The Dream Catcher Legend The dream catcher comes from an Ojibwe legend. According to the legend, hanging a dream catcher near a sleeping person causes the bad dreams to be caught in the web, while the good dreams enter through the hole in the middle and drift down the feathers to the sleeping person. Then in the morning, sunlight enters through the hole in the center to melt the bad dreams away. The beads in a dream catcher represent bad dreams that have been caught. A dreamcatcher can be made more powerful by adding personal totems that have significance to the owner of the dream catcher, such as fur, feathers, claws or bits of horn from the owner's totem animals, stones that represent particular powers, or an item that holds strong memories for it's owner. This dreamcatcher can be shipped internationally. However, check to be sure feathers can be imported to your country. We are not responsible for items seized by customs. Feathers of any kind cannot be shipped to New Zealand, however, we can send a dreamcatcher without the feathers upon request. Not produced by or the product of a particular Indian or indian tribe as defined by 26 USA - 605 et Seq. Handcrafted in the USA. 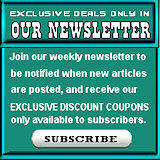 Current Reviews: 1 This product was added to our catalog on 08/13/2010. I received the dreamcatcher today and it is ABSOLUTELY BEAUT ..